Manose's hometown, Boudha, Nepal stands on the ancient route leading from the Himalayan mountains down into the Kathmandu valley. It is just upriver from Nepal's most holy Hindu temple, and is home itself to an important Buddhist shrine. An influx of Tibetan refugees who naturally congregated around the great Boudhanath shrine, and the outward growth of Kathmandu city has created there a nexus where everyone from religious pilgrims, to rowdy enclaves of traders, and Western adventurers converged to meet, mingle, haggle, and gawk. Typical of crossroads the world over, it is dusty and colorful, a Babylon of languages and traditions. It was here that eight-year-old Manose fell in love with the bansuri (bamboo flute) one night, when a fortuitous breeze wafted its song through his bedroom window. Truly, the sound of the bansuri is seductive. Compared to a silver flute it has a resonate quality that seems to actually penetrate the listener physically. And because it is not valved like a silver flute, its potential for subtle expressiveness is practically limitless. We can understand therefore, young Manose's instant infatuation. He purchased a two-rupee flute from a street hawker and began to carry it with him in his school bag where it vied for space with his favorite sling shot. His real relationship with music began when Manose heard about an old man who played haunting music on the shenai, a double reed instrument from India. That man, Madan Dev Bhatta, a disciple of Ustad Bishmilallah Khan, initiated Manose into the study of North Indian classical music. At the same time, Manose began to collect cassettes by North Indian flute maestro Hariprasad Chaurasia. To augment the lessons he was getting from Bhatta, Manose would play the cassettes again and again, trying to copy what he heard, often practicing five or six hours a day. "I wanted to learn," says Manose. "I wanted to have something." Now, as a performer in a variety of genres from raga, to Nepali folk, to fusion rock, his sound he has matured into something at once virile, tender, and playful. From the demanding study of raga music, he has acquired technical mastery and an astonishing ability to improvise. At the same time, we find him wonderfully free to draw inspiration from wherever he finds it, be it the swaying sweetness of a samba, or the lightening fast lines of Celtic masters. When asked what or who has had the greatest musical influence on his playing, he thinks for a moment and says ìthe sound of the flute. He is widely recognized as Nepal's premiere flautist and is the recipient of national awards including instrumentalist of the year. And even while living in the United States, he still manages to be a vital part of the music scene back home. His debut music video airs regularly on Nepali TV, he is a member of one of the county's most popular pop bands, and he performed in Nepal's first jazz festival where he shared the stage with Australian great Don Burrows. In the United States, Manose has performed with Jai Uttal, Krishna Das, and Deva Premal, blue grass great Peter Rowan, and the New Maihar Band, an ensemble created by living legend Ali Akbar Khan. In addition, he has performed in France, Switzerland, Germany, Hong Kong, and Malaysia. After all this, no matter where he goes, or what genre his is playing, it is his pure love for the sound of the flute that remains most palpable is his music. This is clearly a young man who "has something." Simsimay Panima (traditional, arr. Montfort. 6:05) iTunes. >YTmusic. 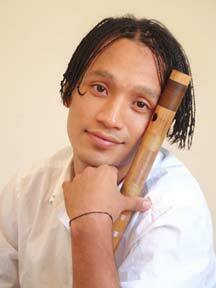 Nepalese folk song featuring Manose Singh on bansuri. From Planet Passion. (Ancient-Future.Com AF-2010). CD/Gift Card, $17.98: Add 1 to Cart. Buy 1 Now. Forest Frolic (Montfort. 4:29) iTunes. >YTmusic. Ancient Future composition featuring Manose Singh on bansuri and Liu Qi-Chao on Chinese flute. From Planet Passion. (Ancient-Future.Com AF-2010). CD/Gift Card, $17.98: Add 1 to Cart. Buy 1 Now.